I absolutely love this exotic specimen grass. I feel dwarfed by it, and I imagine being on the African Savanna or in the jungles of Vietnam - not that I've ever been there or know what it's like, but this huge grass just seems so out of place in an Indiana backyard. I also like how it blocks my neighbors house, and looks to be easily 15 feet tall in just it's 2nd year. The only downside is that it only looks good for a few months a year and then I'm left with a rather bare corner of the yard waiting for this warm weather grass to wake up again. 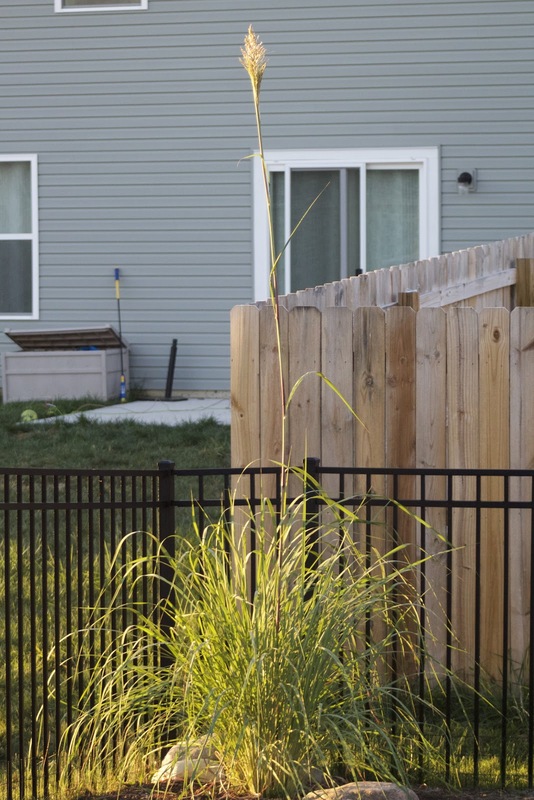 Last year, this grass put up 2 stalks and clocked in for a final height of 10 feet 8 inches. Judging by the height of the fence and the photo from last year, I'm guessing it will easily smash that record. There are also (let me count them) over a dozen large stalks this year.